Posted on April 6, 2016 at 4:55 pm. 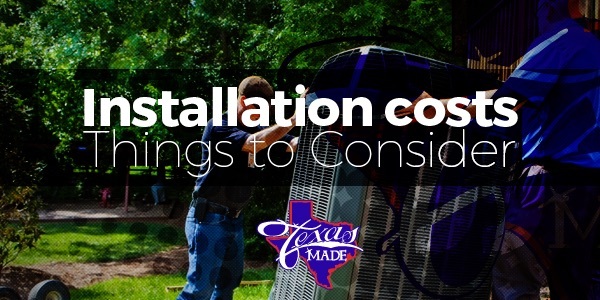 HVAC systems can be a costly expense for your house or business. First, you have to install one, then you have to maintain it and finally, pay for the power they use every month. It is an expense that is hard to avoid, since maintaining an ambient temperature is important for the well-being and productivity of your family and staff. When looking at installing a unit, there are a few factors that come into play. What size do you need? If it is too small you won’t have enough power to cool or heat your home or business. If it is too large, then you will be paying for an unnecessary expense. An HVAC technician will be able to suggest if you need a one-ton or even three-ton system. Part of the installation cost will involve hiring a HVAC contractor who is certified to work with refrigerant from the EPA. Depending on if you have had a central air system before, you may need to install new breakers, wires and duct work. Will you require a new thermostat? Be sure to get a few quotes from different companies to determine if the prices you are being given are fair. Read reviews and get opinions from friends and family on who they recommend. HVAC installation is a big and important job, so educate yourself on who you are trusting to install it in your home or business. A trained professional will be able to answer all your questions pertaining to small, but important issues such as how loud is the system? Does it run quietly? On average, how many years do various systems last for? Is there a warranty? How much do repairs usually cost? What are the most common problems with different models? Keep in mind as well, that there are occasional rebates and tax breaks given for using Energy Star-rated systems. Find out how much per average the system you are installing will cost you on your monthly power bill, this will help make sure you are not shocked when you receive your first bill! An efficient system will save you money over the long term.